"Steve Jobs, CEO and founder of Apple, and creator of devices including the iPod, iPhone and iPad, has died at the age of 56." I was surprised to find a rather large lump in my throat at the news. I was just thinking about him yesterday, incidentally. I saw a cute Angry Birds post-it art installation, which got me thinking about the iPhone and iPad, and then about Jobs himself and the speculation that surrounded his step back from Apple in August. I sent a little ray of light to him as he struggled with his health, and went on with my day, thinking nothing of it. * And then I woke up to this. His 'back story' is a reminder that that you don't have to have the degree or the money behind you to succeed. His definition of success was a little different to the 'standard' ideas, too, which, naturally, caught my attention. From the day I found the quote below on some random website or another, it's resonated with me in such a profound way. "Here's to the crazy ones, the misfits, the rebels, the trouble makers, the round pegs in square holes... the ones who see things differently. They're not fond of the rules... You can quote them, disagree with them, glorify or vilify them, but the only thing you can't do is ignore them because they change things... they push the human race forward, and while some may see them as the crazy ones, we see genius, because the ones who are crazy enough to think that they can change the world are the ones who do." Bad guys die, and heroes such as Steve Jobs die, because both bad guys and heroes are simply humans who have touched our lives in an enormous way. It’s important to always remember that heroes are people; that they don’t have powers that the rest of us don’t have the chance to possess: they simply make choices that lead them in one direction or another. We all have the ability to become someone’s hero, and I fully suspect that one day, the Wolvog will be someone’s hero. And that while heroes themselves die because they are human, what continues to live on are their ideas, the actions they took while on earth, the people who remain alive who think about them and love them. That he will never be fully gone from this earth because there are tangible reminders of him in our very house with our iPad or our iPods. And the way we really honour our heroes is to emulate them; to grow up and similarly repeat (while putting our own flair on it) the good things they did. 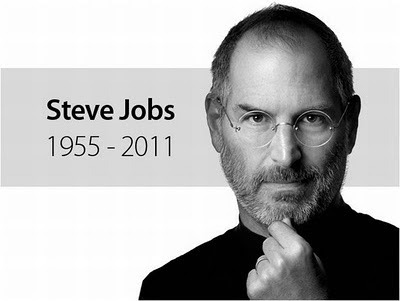 Following his computer bliss would be the best way to honour Steve Jobs’ life. Finally, I told him that the chicken he had eaten at Rosh Hashanah had been my grandmother’s recipe, and I had made it to feel close to her since I was having my parents over for dinner too. So while she is gone, we still are connected to her through her recipes — these cooking ideas that were so important to her while she was living — and we will still be connected to his hero via enjoying his ideas, his inventions. I am very surprised that the passing of a stranger - a great man, without doubt, and someone to be admired, but a stranger nonetheless - has brought on such a response from me, but at the end of the day, a great man is gone from this world. We are lucky enough to have lived alongside someone so great, and our collective existence has been touched by his ideas in some way.